It is not necessary to build your own complex and expensive alternator for a small DIY wind turbine – small stepper motors can be perfect for the job. Found in old computer printers (dot matrix, daisy wheel, and some laser), stepper motors are cheaply (if not freely) available and generate AC power at low rates of rotation (far lower than similarly sized DC motors for example). Therefore small wind turbine blades can be mounted directly onto the motor shaft rather than through a noisy and complicated gearing mechanism. 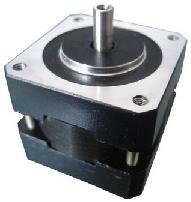 Small stepper motors (i.e. under 1 inch diameter) are only really useful for powering a couple of LEDs, but larger motors can be used to recharge batteries and much more. 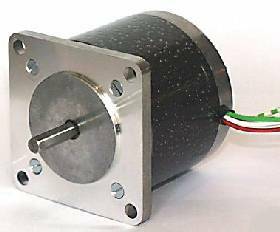 Stepper motors are ideal for use in your first DIY wind turbine generator. 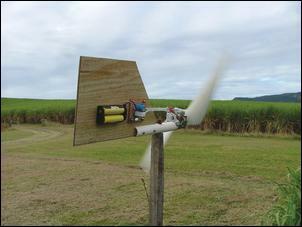 They can be used in conjunction with homemade PVC wind turbine blades to make a very affordable functional wind turbine. In general the higher the number of steps in the motor, the lower the RPM required to generate a decent voltage. On the side of most stepper motors technical specifications will be printed. The important details are the maximum voltage (Vmax), the current per phase (A/ph), and the number of steps or degrees per step. A 3.6 degree stepper motor for example has 360/3.6 = 100 steps, a 1.8 degree stepper motor has 360/1.8 = 200 steps. If you had to choose between two motors with identical voltage and current characteristics then you should choose the motor with the most steps – in the example above the 1.8 degree 200 step motor – since this will give a higher output voltage for the same speed of rotation. If a stepper motor is rated at just 3 volts for example, then you could not use it* to recharge a 12 volt battery or power 12 volt devices. You would even struggle to light LEDs except at high RPM. Therefore you should try and find a stepper motor with as high a voltage rating as possible, so that it will output useful levels of voltage even at slow rotation speeds. A motor rated at 50 volts for example could be used to charge a 12 volt battery at low RPM, whereas a 15 volt stepper motor could only charge a 12 volt battery when up at near its maximum RPM limit. * Find out how to make a simple Stepper Motor Voltage Doubler Circuit here which will can be used to increase the voltage output from the stepper motor (at the same time as reducing the current). A typical stepper motor wind turbine generator will operate at around 200 RPM, so you need to ensure that the motor you choose will put out a high enough voltage for your needs when rotated at that speed. The stepper motor pictured above is rated at 5 volts with 4 phases rated at 1 Amp each and has 200 steps. This could be a good motor for lighting LEDs or charging AA type 1.5V batteries. Note that the electricity generated by a stepper motor is usually in multiple phase AC. To rectify this into direct current (DC) for battery charging or lighting LEDs etc, you need to use a suitable bridge rectifier (or multi phase bridge rectifier. Note that some voltage is lost in the rectification process (wasted as heat). 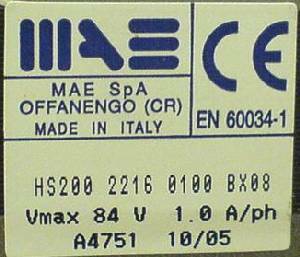 The image above shows the tecnical specifications printed on an MAE Size 23 1.8 degree (200 Step) Stepper Motor from Italy. This four-phase motor will put out up to 1 Amp per phase at up to 84 Volts. Therefore at the low RPMs typical of a DIY wind turbine you could expect to generate a high enough voltage after rectification to keep a 12 volt battery bank topped up. This motor was found oneBay.co.uk for £15 plus £3.50 postage. 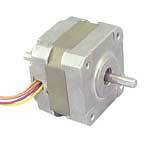 Click here to search eBay for stepper motors now. In order to answer some of the many questions raised by REUK.co.uk site visitors about this article, we have added more detailed information about Stepper Motors to an a second article titled STEPPER MOTOR BASICS. In this article you will find out how stepper motors work, how to identify and use the many wires which come out of a stepper motor, and how to rectify the AC electricity generated by a stepper motor into DC electricity which can be used to light LEDs, charge batteries, and so on. This article also provides a list of excellent online stepper motor resources for further reading.